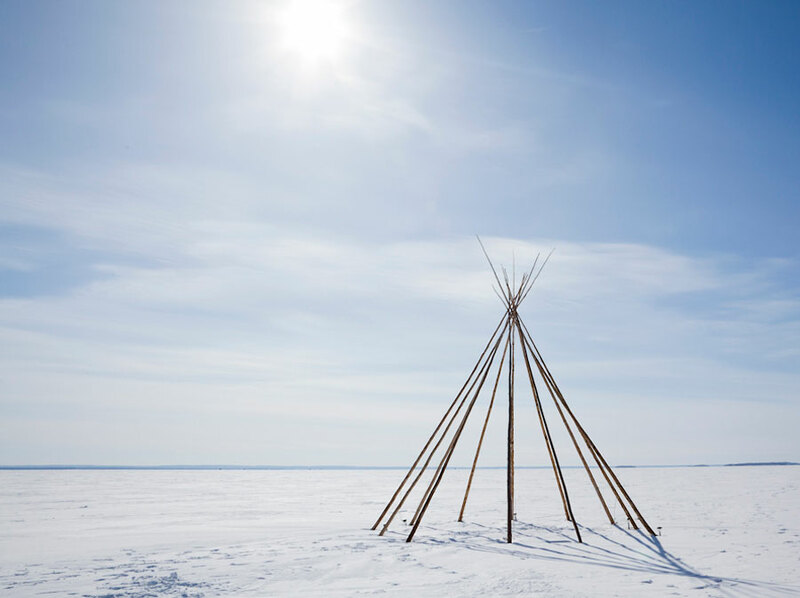 Ice Follies 2016 is the sixth biennial festival of site-specific artwork on frozen Lake Nipissing, rooted in artist-run culture and community arts engagement. This 400km square lake offers an expansive backdrop of ice and sky, for mounting large-scale installations and performances. Video installations, sound-generating structures, lights sculptures, ice letters, community-based theatre productions and even working carousels have been erected in previous Ice Follies exhibits. Ice Follies appears to the visitor as an assemblage of works mounted in a wide semi-circle (or arc) out across the ice adjacent to the main dock and riverfront park on Lake Nipissing. This eccentric collection of artworks echoes the “communities” of ice fishing huts that form elsewhere on the lake. Ice Follies invites arts groups to submit proposals for installation and performance work for the 2016 festival. The theme for Ice Follies 2016 has been announced as “Ojichaagobiishin” which means “It reflects in Water” as this year is a call to action for Ice Follies seeking involvement from other groups to respond to water as the source of all life on earth. With the eminent threat of “land development” or “pipelines” looming over Canada both Aboriginal Territories and Municipalities turn their attention towards “Life”. Without the fresh water sources of lakes such as Nipissing nothing can survive. “Ojichaagobiishin” forces us to reflect on water and look at what we see. Looking in water reflects our own image back forcing us to look at ourselves. In order for the world we live in to change towards a safer, healthier place, we have to change ourselves. Working as Curator, Clayton Windatt of Zakide is recruiting the aid of Edgardo Moreno as Composer and Eddie Jeanveau as Audio Technician to create a series of stand alone audio installations entitled “Nisidotan” or “Understand by Hearing” responding to the theme of Ojichaagobiishin for Ice Follies 2016. In the creation of Nisidotan, a team of audio technicians will document the sounds of Lake Nipissing over the course of several months. The sounds under the ice as it shifts and cracks over time will be captured making environmental audio from Lake Nipissing. This will give an organic voice to water. Moreno will then process these into a sound-scape installation utilizing sounds from community intertwined. This mixing of sounds and tones will form a faint melody-like immersive piece installed on-site. With the temporary and fragile nature of water as a resource, Moreno will explore the calming effect of water sound and the drastic affect of a threatened environment. 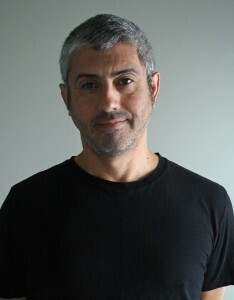 Edgardo Moreno was born in Santiago Chile and is Toronto based composer who specialises in film scores as well as contemporary dance and theatre. He has traveled as an artist in residence to Sweden, Argentina, Banff Arts Centre as well as Chile, Trinidad, Puerto Rico, Venezuela to study local musical traditions. He has worked extensively with choreographers Allen Kaeja, Karen Kaeja, Alejandro Ronceria, Penny Couchi, Susan Lee. He traveled to Sweden in September1999, 2001 to create music for choreographer Allen Kaeja. In his collaborations with Allen Kaeja he has scored music for commisssions from London England, Norway, Mexico, Israel. He has compsosed music for Allen Kaeja’s films ‘Sarah’, ‘Witnessed’, ‘Zummel’, ‘Resistance’, ‘Old Country’, ‘Asylum of Spoons’. Dramas include Headhunter, Gummy, The Letter. He has written three seasons for television travel show ‘Exploring Horizons’ (Outdoor and Life Network). He has also created and produced music for CBC, CITY TV, BRAVO, and a feature length documentaries ‘El Contrato’and ‘Six Miles Deep’ NFB, ‘Doctors With Borders’, ‘Shift Focus’ OMNI, Hitler’s Canadians (History Channel), Chichester’s Choice (TVO), Under Rich Earth. As a freelance commercial composer he has created music for clients that include IBM, Loblaws, Bravo’s Freedom Series. His music has been licensed world wide to clients such as Fossil Watches, Relic Hunter, Current TV U.S.A. Fashion Television, Flash Press Poland, Blue Rabbit Films, Haemimont Games, Karina Garcia Spain, Kobalt Music New York and many more. He has worked extensively as an educator in schools through the Ontario Arts Council Artists In Education and Residency grants. Has led workshops for the Toronto Symphony musicians for Adopt A Players program. He has worked for the Ontario Arts Education Institute as an Artist Leader instructing teachers in music pedagogy. National Ballet project ‘Creating Dances’ 1994-2005. Distillary Arts Outreach project as artist and director 2005, 2006, 2007.